Do you have a friend who is always dating, but can’t seem to form a relationship that lasts? Ever felt that looking for the ‘right one’ is like searching for a needle in a haystack? I’m going to let you in on a simple secret that will make the quest for finding lasting love easier. But first, let’s consider where many people go wrong. What often happens is that people to find someone they are attracted to and then begin behaving as if they are an actor auditioning for a role in that person’s movie. It’s as if they are reading lines; playing a part, and saying the things they think will make the other person love them. Meanwhile, the object of their affection may be doing the exact same thing in return. 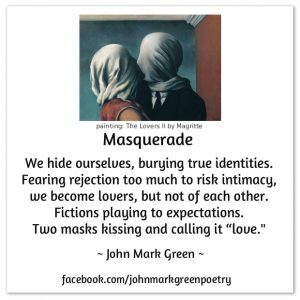 The result is that instead of showing their true selves, masks are put on, and two fictional characters romance each other–perhaps even fall in love. Acting a part is hard to maintain, and over time the real selves begin to show. Upon realizing they were in love with an illusion, incompatibility becomes evident, dissatisfaction sets in, hearts drift, and things eventually fall apart. You showcase your authentic self. Think of it as advertising. By letting other people know who you are–your values, passions, and personality –they can more easily know if they are interested in you. Yes, you will end up having some people walk away, but that’s not bad. It’s a very good thing, because you both avoided wasting time and money on dates which would have never turned into an enduring relationship. Time saved by not pursuing incompatible partners is time which you can invest in getting to know other authentic people who might be a good match. For a relationship to be genuine and durable, you must be loved for who you are. Why would you settle for anything less? Physical attractions are plentiful, and shallow relationships can be easily entered into, but finding a deep and lasting connection is rarer. It must be built on the foundation of authenticity. In your quest for love, be real in how you present yourself, and only consider those who are willing to be real with you. This is a simple ‘secret’ which can help you find the deep love you desire.